This 4 day masterclass intensive will be carried out by International Master Trainer Natalia Smirnova who is a highly respected PMU Master. The training has been designed to enhance your PMU skills and techniques with relation to shaded brows, Hairstoke Brows, magic eyeliner and blush lips. All students will practice on live models under the supervision of Natalia and masterclass host Theresa Wild, to perfect their newly acquired skills. The masterclass will facilitate a small group of students (maximum of 6 delegates) to ensure personal feedback and adequate hands on experience are provided, in addition to onsite presentations and associated theory. This masterclass is suitable for qualified Permanent Makeup Technicians, Microblading technicians or SMP Technicians with a minimum of 1 years’ experience who would like to learn these in demand, market focused and popular techniques. Subject: Natalia Smirnova: 1-3 day training for shaded/hairstoke brows, russian Eyeliner and Lips. Natalia Smirnova is a highly respected permanent makeup artist who has worked very closely with Sviatoslav Otchenash and has trained all of the academy trainers in the micropigmentation industry. Over the years she has acquired extensive experience in the field and has trained with some of the world’s most respected masters. 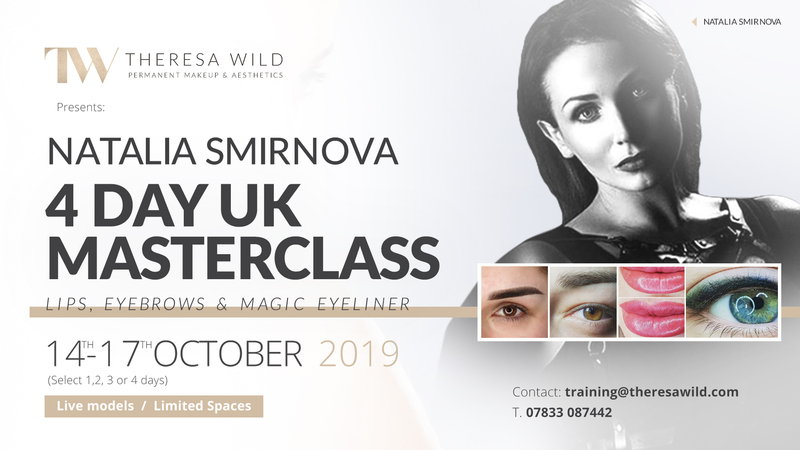 Natalia will showcase throughout the masterclass 3 of key techniques, namely; magic eyeliner, shaded brows and blush lips which you’ll be able to implement instantly into your portfolio of treatments and offer to clients, who would like to have an understated and elegant PMU treatment, which highlights their natural beauty.